GreazeFest - Latest News: GreazeFest new Pinup Contests! GreazeFest Presents: Two exciting new Pinup Contests for 2018! A high-octane, hot-rod rockin’ pinup contest for the wild at heart, this is where you can show off the hot rod and rockabilly lifestyle, from double-denim to King Cry Baby cool, this parade will be scorching hot and supercharged. Kelly 'The Flying Pinup', national title-holder and recently awarded Miss Viva Las Vegas Second Runner-Up in 2018, will be hosting the parades. Behind the scenes, Lori Lee, Miss Chrissy and the Lindy Charm School for Girls will help you be your best on the day, and most importantly, have some fun! - Plus include your suburb and mobile contact. 12 finalists will be selected to take part in each parade, and will be advised prior to the event. You can enter either parade or both parades, it’s up to you. Each parade features one outfit only, which must match the theme of the contest. All pinups will receive complimentary entry to GreazeFest on the day of the corresponding parade. Our guest judges will award the winners with a sash and extra special prize packs. There may be openings for promotional activity leading up to the GreazeFest. With permission, finalists will be contacted for any opportunities to work with newspapers and the media prior to or at the festival. Submissions close on Monday July 2, 2018. All entrants will be contacted whether they are chosen to be a finalist or not. Newcomers to the pinup scene are welcome to enter. 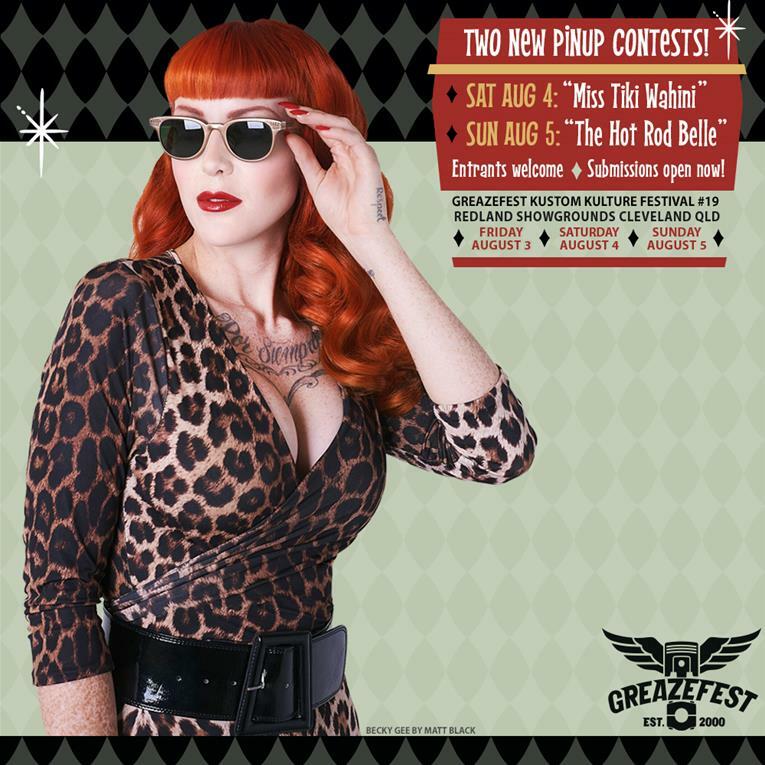 This is your chance to be part of two fun, new pinup contests at GreazeFest, so get your entries in now!